While making my mini table saw I bought a 12 V motor speed controller module from eBay. Fair enough, I thought ... that was an easier and straight forward solution. But then I decided to make my own. When you connect your motor to the screw post, test the motor direction before committing yourself to the orientation. The motor will run in either direction, the choice is yours. I looked around on the interweb for suitable motor brackets and they were all either too expensive or took too long to arrive. I've got 15 of these suckers that I want to mount in various tools and projects ... so I needed to make something extraordinarily cheap and durable. My solution was to simply cut up some angle aluminium and drill holes in it to fit my motors. One angle piece has a hole for the axle and a threaded hole for a grub screw to hold the motor in place. At the back, there is another angle piece with a hole drilled through it for the rear axle mount. The two angle pieces are screwed together via yet another threaded hole. I've also drilled holes through the base so that the bracket can be mounted wherever I need to mount it (depending on the project!). Anyway, making the brackets doesn't take long and, because it's aluminium, it is durable, light and cheap. Well ... on to the next project! rkondner in that 555s have a horrible output waveform and the bi-polars are short of the rail by over a volt. I am using this output format with uSec. pulses and someone wrongly said that the 555 cannot drive this output and I wondered why he said that. Anyone building this circuit should consider fitting a load resistor for, say, 10mA so that the 555 output actually has some work to do rather than simply waving at the FET gate. What, in your opinion as the designer, is the maximum safe current one would expect this unit to pass? Nice build too, I like it! oh ... and thanks ;) I'm glad you like it. Sorry I think my question was misleading. I meant to ask is it possible to get an output voltage 0V to +15V (rather than +5V to +15V)? Okay, I understand your question now :) The limiting factors to get to 0V, then, are the minimum supply voltages for the various components. The NE555 datasheet says that the operating range for the chip is 4.5 - 18 volts, so the unit will not operate on less. But from a functional perspective, the PWM duty cycle can be 0% so that would result in no supply to the IRF530. 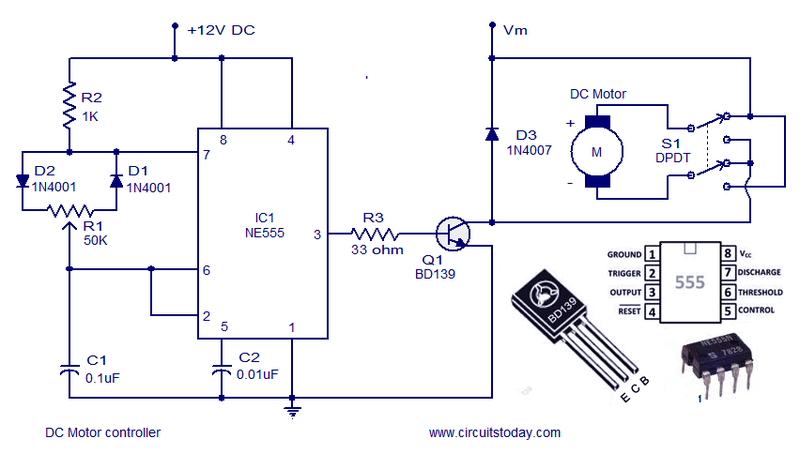 Obviously, the circuit will not operate at 0V, but nor would it work at less than 4.5V. On that basis, you would be limited to 4.5 volts on the input side. Hey BeachsideHank, the operating limitation in this circuit is the 555 timer. This piece has an operating limit of +5 to +15 volts. You could get around that by using a regulator on the input side (say LM7805) and using a transistor to switch the other side of the circuit for higher voltage. You would also have to have a different supply connection as the DC barrel jack is only rated to 18 volts. The 1N4001 is rated to block 50 volts and 35 volts reverse voltage ... so you could conceivably replace the rectifying diode with a 1N4004 to increase it to 400/280 volts respectively. This would then mean that the IRF530 would be your limiting factor 100 V 14 Amp. How come this piece has an operating limit 0V? Is there anyway to alter it to 0V to +15V? Like the design and instructions, really helpful. Hi MattyJ3, the NE555 has an upper limit of 15V, so that's the main limiting factor in the design, if the input is less than 5V, the NE555 doesn't do it's thing (create a square wave, in this application). There are a couple of things mentioned above that would increase the upper limit of the operating voltage, but, there are a bunch of low voltage rated parts to consider (DC Barrel Jack and NE555 mainly). I have used 555 devices for a long time and the part you are calling out is, I believe, a bipolar parts They also make CMOS version of the part and I find them very superior. The 555 outputs will drive a FET fine at low frequencies which is probably ok in this application. For higher powers / voltages you might try a CMOS device or get a FET driver. What I have seen in 555 outputs is a small glitch in the output where both the pull up and pull down transistors are both off. Bipolar transistors exhibit storage times and IC designers make darn sure there is a dead time when both transistors are off. Both being in a conducting state at the same time is very bad. CMOS transistors do not have a storage time. This output glitch could result in large switching loss. Also, reconsider the 100 ohm gate resistor. Typically 5 ohms is plenty and I worry that 100 ohm would introduce high switching loss. I noticed a small heatsink on your FET. Going to a CMOS parts and dropping the gate resistor could make a big difference. I would love to hear if that helps. Be sure to post what you try, I am curious if you can drop loss to where that heatsink is not required! Great comments Bob. I've got another 15 to make so I'll source a CMOS timer and experiment. Although that usually takes some time. The tyranny of distance when buying everything from ebay. For the application tgat I have and considering the cost, this design is still a satisfactory solution. The drain resistor will drop, though! The critical info for any power supply is input/output voltage, and max current. I suggest you provide that information within the first one or two paragraphs to allow readers to quickly identify whether the project is suitable for their purpose. Thanks for the comment and thanks for the advice. I hope that, should you build this circuit, that you find it useful and fun. Nice circuit. One thing of note: you can actually drive a higher voltage circuit with the MOSFET while still running the 555 on a lower voltage, if needed. So you can actually switch higher voltages (limited by the MOSFET characteristics). True, carlos66ba, you can, that's kinda what I was suggesting with the inclusion of an LM7805 voltage regulator. There are other limitations in the circuit too ... the DC barrel jack is rated to 18 volts, so that'd have to go too. Nevertheless, 15 V is the practical safe limit for this design as it stands. By all means, mod the circuit! What program you use to design pcb? hi avik111, I'm using Fritzing. It's free and pretty good.